A spooky headless horseman and a group of re-enactors. What's John Nettles gonna do? More about the filming, interviews with the cast etc. Couldn't help being disappointed. McNulty from The Wire as Cromwell - what's not to like? A simplistic plot and shallow characters make for a missed opportunity, though I did quite enjoy John Simm as the brooding Sexby. All four episodes can be watched on 4oD here. A 15-minute spin-off from the series, shown as part of Comic Relief's Red Nose Day 1988. You can watch it here and read the script here. I visited Rockingham Castle on a school trip back in the early 80s. This series was partially set there (also at Lilford Hall in Northants), and had just been broadcast. I can still recall the jaunty title music, and happily it was re-released on DVD a few years back, though was all too quickly deleted again, leaving it available only at prohibitive cost on Ebay and Amazon New&Used (Region 2, that is - there is also an Australian version out there). 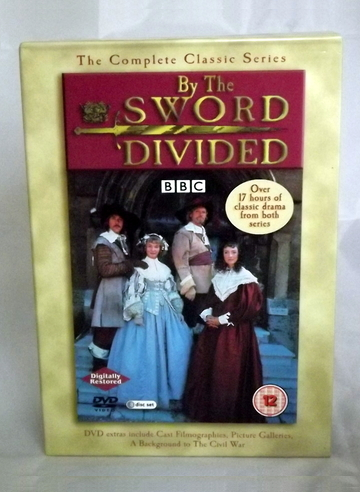 The two series follow the fictional Lacey family as the conflict divides their loyalties, taking in the start of the English Civil War right through to the Restoration. A strong cast, well acted. Until recently a number of full episodes were up on YouTube but they seem to have disappeared. A search should yield one or two montage clips to bring you a flavour, such as this one (Cavaliers, Phil Collins and the woman from the Gold Blend advert: the 80s does the English Civil War!). Trivia: Jeremy Clyde, who plays Charles I had played the same role in the 1977's The Children of the New Forest, a series based on the 1847 novel by Frederick Marryat. The theme music was released on 7" vinyl by BBC Records in 1983 (RESL 137). Recorded by 'Consort', conducted by John Altman, the 'A' side is the theme music, with a second track Arnescote on the 'B' side. Both were composed by Alan Blaikley and produced by Blaikley and Ken Howard. This is also long deleted but usually to be found second-hand on Ebay. Or you can just listen to the stirring title tune here. Update December 2013: A kind soul has posted the whole of the first series on YouTube - find it here. A one-series BBC production which only ran to five episodes. Richard Morant, who plays the young Prince Charles, died recently. His obituary in the Guardian can be read here. Actor Michael Beint was also in Witchfinder General (see below). Low-budget 'psychedelic trip into magic and madness' from cult director Ben Wheatley. A small group of deserters flee from a raging battle through an overgrown field. They are captured by two men: O'Neil and Cutler. O'Neil (Michael Smiley), an alchemist, forces the group to aid him in his search to find a hidden treasure that he believes is buried in the field. Crossing a vast mushroom circle, which provides their first meal, the group quickly descend into a chaos of arguments, fighting and paranoia, and, as it becomes clear that the treasure might be something other than gold, they slowly become victim to the terrifying energies trapped inside the field. Will Fletcher, a boy in his late teens, is left to live alone after two years of civil war has torn his family apart. After sighting his brother Sam alive in a Royalist patrol, he is captured by two Parliamentarian scouts, Thomas Mason and John Turner. Together they must travel back to the remainder of their company, who were part of a crushing defeat several days earlier, a defeat that still haunts Thomas and John (30 minutes). A $14 million dollar film which brought a £59,000 return in the UK. Or so IMDB says. 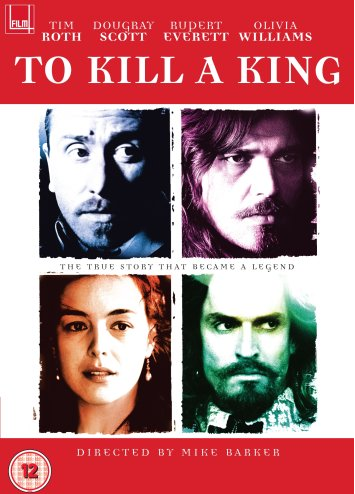 The story concentrates on the power struggle between Cromwell and Fairfax in the run up to to the trial of Charles I. While the script explores the complex political machinations of 1647-49 in more depth than others on this page the chief issue is the casting: the principals are all at least ten years too young. Rupert Everett as the king has presence and certainly looks the part, though steers far wide of the mark (at least for the first half of the film) in playing Charles as a wry, charismatic schemer (Alec Guiness in the Ken Hughes film is far more successful) - and Tim Roth is too slight a presence to carry off Cromwell. A histrionic, inappropriate score drowns out the dialogue spoils many of the interior scenes, which appear to be 18th century in decoration. After reading up on filming locations I realised why this might be: Hampton Court was used a number of times, much of it re-modelled in the baroque style by William of Orange at the end of the century. The musketeers travel to England to try and prevent Charles I's execution. Adaptation loosely based on Dumas' Twenty Years After. Third film directed by Richard Lester, following 1973's The Three Musketeers and 1974's The Four Musketeers. Stars Oliver Reed, Michael York, Richard Chamberlain, Christopher Lee and Roy Kinnear, who sadly died during the filming. Kim Cattrall appears as Justine de Winter. 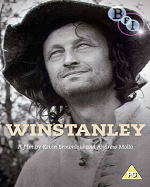 Kevin Brownlow and Andrew Mollo's film about the Digger leader Gerrard Winstanley and his followers trying to establish a community on St George's Hill in Surrey was film shot in black and white and featured a cast of amateurs and real-life activists. The title role was played by ex-teacher Miles Halliwell, a boyhood friend of Mollo who had also featured in Mollo and Brownlow's first film about a Nazi invasion of Britain, It Happened Here. Watching the film it's clear that Halliwell's personality and charisma play a significant part in the film's success. Writing in his obituary in the Independent in 2004, Brownlow described Halliwell as 'one of the finest men I have ever known'. Director Michael Reeves' film starring Vincent Price, Ian Ogilvy, and Hilary Dwyer is always listed as a Horror but never really turns horrible enough to justify admission to the genre (though I suspect the BBC screening I saw omitted some of the more gruesome original scenes). Mark Gatiss has suggested that it falls into a sub-genre of late 60s/early 70s 'folk horror' that includes The Wicker Man, though Witchfinder's characters and plot are far more predictable than Robin Harday's cult classic. Price, however, is on top form as the 17th century witchfinder Matthew Hopkins, and the East Anglian scenery is a delightful, if incongrous, background to the depictions of torture and execution. Reading up on the film I was amused by the on-set fall-out between the very young (then only 24) director and the much older, established lead: (Price: "I've made 87 films. What have you done?" Reeves: "I've made three good ones"). There's much more about this on the film's Wikipedia page. Re-released on DVD 16th January 2012. London: A Tale of Two Cities - Dan Cruickshank follows in the footsteps of John Stow and John Strype, two of London's greatest chroniclers, to explore one of the most dramatic centuries in the history of London. In Our Time - a full list of 17th century-related episodes from Melvyn Bragg's Radio 4 programme (see the clips on the Home page for direct links to the recordings). The significance of Hobbes' Leviathan to the trial of Charles I and more. Making History - Episode of the Radio 4 series on 17th century London refugee camps. Making History - Listener Paula Skillen asks Professor Mark Stoyle whether WWII propaganda helped resurrect interest in the 1643 Siege of Plymouth and the Sabbath Day Fight (from around 8 minutes into the broadcast). Making History - Tom Holland talks to Professor Ronald Hutton about why Richard Cromwell's short tenure as Lord Protector is so often ignored (from around 17:45 into the broadcast). Melvyn Bragg - him again! - recorded another Radio 4 series Voices of the Powerless, in which he 'explored the lives of the ordinary working men and women of Britain at six critical moments across the last 1,000 years'. Once of the broadcasts features readings of surviving sources from the siege of Chester in 1645. 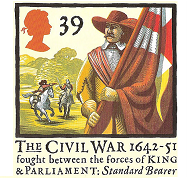 English Civil War - BBC play written by Paul Farley. Comic drama about a re-enactor who walks into a supermarket with a musket and declares a siege situation. The workers are quite excited about having their till-time interrupted, though the novelty quickly wears off and they hatch a plan of their own. A comment on modern-day consumerism with its heart very much worn on its (buff coat) sleeve early on, though its charm kicks in after 20 mins or so. One for a rainy afternoon drive back from Naseby. Initially broadcast in 2004. Lawrence Norfolk on Open Book (from 23:00) - the author talks about his latest novel, John Saturnall's Feast, about a 17th century orphan who becomes the greatest cook of his age. God's Revolution - 12-part BBC series (1988) written by Don Taylor. Set 1647-49. Cast and episode titles here. The Stuarts: This War Without an Enemy (2013) - Play by Mike Walker. Charles I's best qualities come to the fore only in defeat, when there are no more decisions to take but only courage and calm to see him through. Only in this moment of perfect stillness can he begin to understand what has brought him here. The Sit Crom (1990) - Spies and sinful vegetables at Firebasket Hall. Civil War comedy with Joss Ackland and Miriam Margolyes.